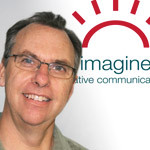 Small business marketing | Burlington ON | Imagine Creative Communications Inc.
Meet Craig Fairley, the person behind with passion. Every successful organization has a passion for what it does. Our passion is to help our clients share their passion. We do this through award-winning and eye-catching graphic design and effective marketing communications. We understand the need to become a part of the vision, goals and operating culture of our clients before we can offer solutions that fit. We always begin our relationships by listening to our clients-to their ideas, their passions and their message. Only then do we advise, research, design, write and deliver. That means creativity and excitement go into every project. Every time. Imagine Creative Communications has experience with logo design and brand development, annual reports, small business marketing strategies, web design, brochure and document design, direct mail—and many other solutions—for a diverse group of clients. And that diversity is what makes us passionate about what we do. Each project is new, exciting and fun. We understand the importance of delivering the right message to the right audience in the most effective way. We treat every client the way we want to be treated; in a spirit of collaboration and with creativity, energy and integrity. We would really enjoy helping you expand your brand and build new relationships. We have done this successfully with other businesses and nonprofit organizations. Imagine Creative Communications has won TWO silver Summit Creative Awards. These awards give international recognizing to small design and marketing companies from around the world. Nominated twice by clients for the Burlington Chamber of Commerce Business Excellence Awards. Burlington Post Reader’s Choice Awards Platinum award for Best Graphic Designer. Waste Environment & Technology Magazine, 2018 Best design for a fractional ad. Imagine Creative Communications gives back to the community through pro bono work for local nonprofit organizations and community groups. Currently we support Home of Grace Care Centre. For 16 years we supported Burl-Oak Theatre Group with design work for their community theatre productions.